This beautiful temple was built on the east bank of the Nile by Amenhotep III, ‘The Magnificent’. With his wife Queen Tiv, whom he dearly loved, he ruled Egypt during the peaceful and stable 18th Dynasty. The temple was dedicated to the Theban triad: the great god Amon-Ra, his wife Mut, and their son Khonsu. Luxor temple suffered some damage in the reign of Amenhotep’s son Akhenaten, when the name and figure of Amon were erased, but it was reconstructed in the reigns of Tutankhamon and Haremhab. 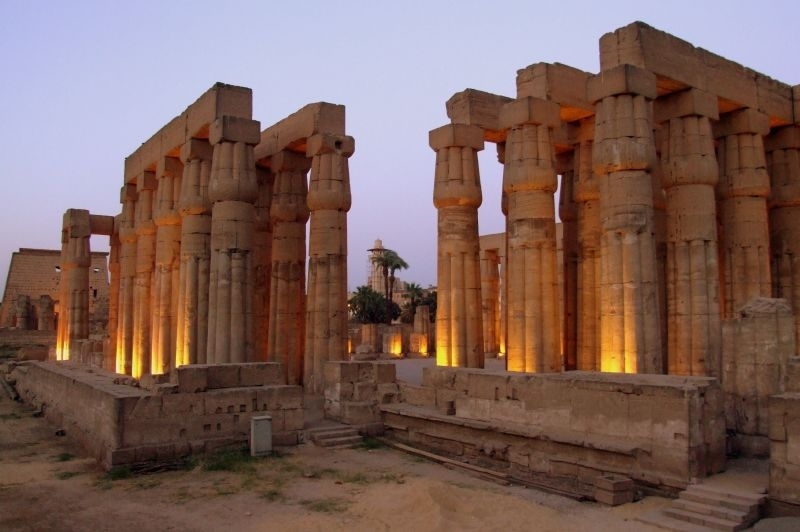 In the 19th Dynasty, Ramses II carried out major work there, particularly when he constructed a new court and entrance. In front of the Entrance Pylon of Ramses II, he placed six colossal statues of himself, four standing and two seated. He also erected two granite obelisks inscribed with his names and titles - one is now in the Place de la Concorde in Paris. The vertical grooves in the front section of each tower of the pylon were for the insertion of standards. The square openings above them held braces. Both towers were decorated with reliefs of Ramses’ Battle of Kadesh. They are not in good condition and are somewhat difficult to see. On the right-hand tower (a) are reliefs of the Egyptian camp with Ramses II consulting with his military commanders. On the left- hand tower (b) he charges the enemy, managing to keep them engaged until reinforcements arrive. The Court of Ramses II (A) is entirely surrounded by a double row of smooth-shafted papyrus columns with bud capitals. 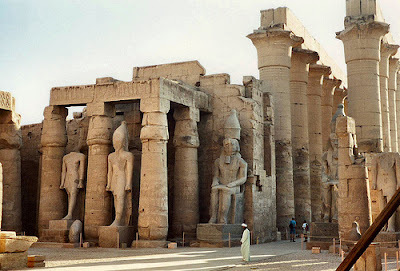 Colossi of Ramses, some usurped, stood between the columns of the first row on the rear half of the court. The shrines to the right, which were built by Hatshepsut, usurped by Thutmose III and restored by Ramses II, were dedicated to Amon (centre), Mut and Khonsu. The Fatimid Mosque of Abu el Hagag, to the left, was part of the mediaeval village built on the ruins and rubble that had accumulated in the temple. On the right-hand rear wall of the Court is an interesting representation (at c). It shows the facade of the temple of Luxor, with one seated and two standing colossi and one obelisk on each side of the entrance gateway. The flag-staffs are in position and pennants flutter. Approaching (from the right) are some of Ramses II’s sons. Behind them are fattened sacrificial animals being led by nobles. Some of the bulls have decorated horns; one has metal tips in the form of hands. Queen Nefertari is shown shaking two sistra. Behind her are princes and princesses. Ramses II had at least 111 sons and 67 daughters. The Colonnade (B) was designed by Amenhotep III and decorated by Tutankhamon and Haremhab. Seti I, Ramses II and Seti II also recorded their names there. It comprises seven pairs of majestic columns, with calyx capitals. The walls are decorated with scenes of the great Opet festival when the sacred barges of Amon were taken in splendid procession from Karnak to Luxor temple. This took place during the second month of the season of inundation, at the height of the flood. After twenty-four days of celebration, the barges would be returned to Karnak. The reliefs that give a full picture of this joyous ’festival are in rather poor condition. The procession begins on the right-hand wall at Karnak temple, where the white-robed priests bear the sacred barge of Amon out of the gate of Karnak (d) and down to the river’s edge (e). The people clap their hands in unison, acrobats perform (f); there are priestesses with sistrums (rattles), people dancing and some kneeling in adoration. The procession makes its way upstream; the king’s chariot is on a boat, which is towed like the sacred barge of Amon (f). Finally, there is a sacrifice of slaughtered animals (g) and offerings to Amon, Mut and Khonsu at Luxor temple (h) with great fanfare. On the opposite wall the return procession is shown: sacrificial bulls are led by soldiers, standard-bearers, dancers and Nubian slaves (i). The barges float downstream (j), and the final sacrifice and offerings are made to Amon and Mut at Karnak temple (k). 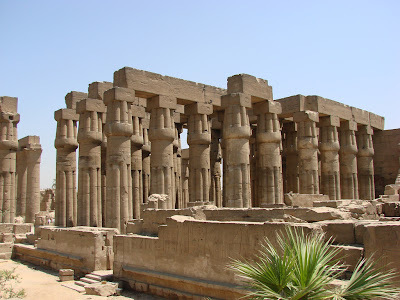 The Court of Amenhotep III (C) is a fine example of the architecture of the 18th Dynasty. The double row of columns have clustered papyrus-bud capitals and are in a good state of preservation. There were originally roofing blocks across the architraves, but the spacious central part of the court was open to the sky. The side colonnades end, in the south, with a group of columns arranged in four rows of eight, which is usually called the Hypostyle Hall (D). Immediately to the rear is that part of the temple that was converted into a Roman shrine after the removal of some columns; the doorway leading to the Sanctuary was walled into a curved recess; the reliefs were covered with plaster and painted over with the figures of Roman emperors. In the bottom row (left to right) Amon converses with Thoth, god of wisdom, the pharaoh and his queen, in turn. Then he brings the Key of Life to the nostrils of the queen, and Khnum moulds two infants, representing Amenhotep and his guardian spirit or ka on a potter’s wheel. In the middle row (right to left), Thoth foretells the birth of her son to Amenhotep’s mother. She is conducted, pregnant, to Isis and Khnum; she is seated on the birth couch, with the birth deities, Bes and Tauret beside and beneath her; to the left Amon holds the child in his arms. Beside him are Hathor and Mut. In the top row are reliefs of the suckling of the infant king and his presentation to Amon. The inside of the Sanctuary (m) was rebuilt by Alexander the Great, who removed the four original columns to do so. The outer walls are decorated with reliefs that are in good condition, bearing traces of the original colour. Inside the Holy of Holies stood the gold-plated statue of the great god, which was only brought out to be viewed by the populace on special occasions like the Opet festival.